Following our first post, three more attendees, Thidarat Thaiyanon, Maciek Sobczak and Nisrine Sarkis share their stories with you! 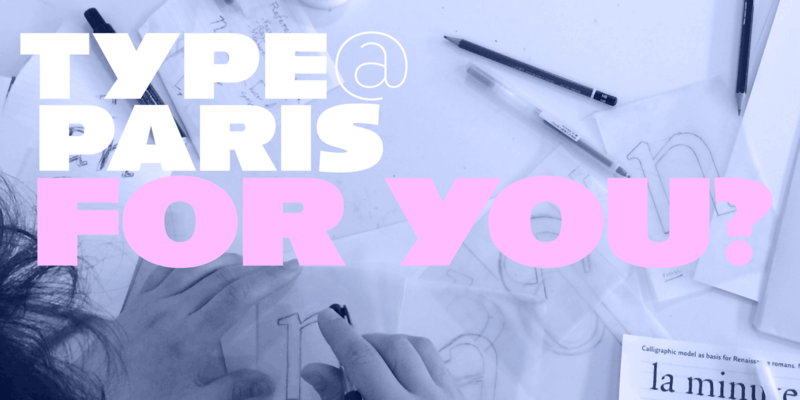 TypeParis16 is the second edition of the type design programme launched in 2015. We are in constant contact with all the attendees from last year. We thought that it would be interesting to ask some of them a few questions about their experience, past and future. Maciek Sobczak, TypeParis15, June 2015. Thidarat Thaiyanon: I decided to take the TypeParis15 course because typography was always my interest but I never really dared to be deep in type design. I thought it takes the super power skill and a very logic and organised thinking which is something too complex and confusing to me sometimes. However, I decided to give it a try. Even though half of the reason is that I just want to travel and take some course during my vacation! Maciek Sobczak: After achieving a MA diploma in industrial design I was working for nearly 10 years in the design sector, here in Poland. In those days I was dreaming a lot about improving my skills with an extra course, especially abroad. Having worked on many graphic design tasks (editorial design, branding, wayfinding), I was often involved in selecting fonts that would work best — but I relied more on intuition than on a conscious calculation (consideration) or study. During my daily practice, I always had a deep respect for the projects that were developed altogether with a dedicated typeface, precisely crafted for the assumed job. What’s more, I was always impressed by the work that type designers do. I did not necessarily want to become one — but I knew it would be interesting to study. One of the educational opportunities that I considered was the Type@Cooper Condensed programme, which (unfortunately) for a few reasons was not so easily affordable/achievable. And, suddenly, a new programme was announced — and it was to take place in the centre of Europe! Enchanted by a stunning team of instructors, guest critics and speakers, I didn’t hesitate to sent my portfolio. And I completely didn’t know, what should I expect… as well from the programme, as from myself. Nisrine Sarkis: I work mostly in branding but I have always been fascinated with type, specifically with Arabic typography that is still in its booming phase. I started experimenting with lettering in my free time but I wanted to explore the world of type design as well. TypeParis15 felt like the perfect opportunity for that seeing that it’s a one month intensive course and that I didn’t have to quit my job to go for it. Nisrine Sarkis, TypeParis15, June 2015. TT: At first, I thought I might end up designing some ‘cool graphics letters set’ but it turned out I had to start from the very basic foundation, to actually ‘draw’ a letter. The atmosphere in the class was really nerdy. Everyone discussed how the very little angle of the serif makes the difference for the whole type set. (I swear I didn’t see any difference by that time :P) I felt a bit off the edge and didn’t fit in at first. However, after a few visits to the libraries, museums, type talks and of course some parties!, all the nerdy energy from the classmates, lecturers and TypeParis team made this complex stuff fun and exciting to me. I started to understand every line, curve, shape, space.. every little element and decision I had to make to design a letter. I’ve learned to see, to open my eyes, which I consider very important — at least for me though. And finally, I’ve learned to design a typeface and have my own font on my computer! with the valuable critics on my type from teachers and guest lecturers that helped me. Merci! Merci! The whole 5-weeks was such an experience. The only thing I’d change is that I’d stay 2 weeks longer so I’d have more time for my vacation. MS: The programme was intense and split into two parts: first was focused on analogue tools, the other was digital, with computers and professional type design software. It may sound funny, but I must admit that the first part was also my first experience with tracing paper — I hadn’t find it useful in my past design practice. The digital part was great and could even have lasted longer. I’ve learnt a lot about the software, both from the instructors (the unforgettable visit of Rainer Erich Scheichelbauer from the ”Glyphs” App could even been earlier!) as well as from the other, more experienced, students. Every week the programme was completed by Wednesdays’ Type Talks and Fridays’ outings. I was amazed by the respect of our instructors towards French typographic history and tradition (hmm… if every generation of French typographers shared such attitude, it must be the reason why they’re so strong). In Paris we studied in a group of 16 people from different countries (every part of the world) of different ages, with various careers and experience — but all of them had one thing in common: great portfolios. What I must mention is the helpful and supportive attitude of French students (Julie, Benjamin, Nicolas and Ilya, who is in fact a Russian based in Paris), who were sitting almost in each of the four corners of the classroom (was it an accident? ), and cooperated actively. All the classes were in English and the French students seemed to avoid speaking their native language, which was pretty generous (all the group gained more). I was quite lucky, because I’d started to look for a Paris accommodation just one week before the course began. Finding a place to live wasn’t difficult: I managed to rent a very tiny flat near Voltaire for a reasonable price. Thanks to the convenient location it was possible for me to get to the École de Communication Visuelle at Rue Buffon (that’s the place that hosted the course) on foot, which allowed me to save money on public transport. During these five weeks I focused on the course, so I didn’t find much time for sightseeing (fortunately, it was my fourth visit to Paris) — but generally the TypeParis15 team found a few moments to meet together. NS: A LOT. Type design is a totally different world. It requires a sort of obsession and attention to detail that I enjoyed quite a bit. I learned the process of starting with calligraphic letters then re-drawing them while keeping in mind that all the letters should fit into one system before taking them into the software. The instructors were very generous with their time and resources and the weekly interventions and talks were greatly enriching because each type designer had their own way of thinking a typeface through. And the best thing about it was the chance to be taking all this information in with beautiful people from different cultures and backgrounds, which turned the long hours of learning into a very fun and exciting experience. First week: Thidarat Thaiyanon is on the left of the table, TypeParis15, June 2015. TT: My life hasn’t changed much. I’m still working as a freelance graphic designer. But I’ve got more confidence working on logotypes and everything related with type and I’m having fun with it. I wish I could keep on improving ‘to see’ and ‘to draw’. MS: After TypeParis15 I came back to Poland, feeling much stronger. The course gave me a strong knowledge about typefaces: how they are constructed and why do they work. I am much more self-confident about making right decisions, now I am sure that I choose fonts and judge them in a more conscious way: Yes, typography, it’s a cosmic, almost scientific knowledge — not just a matter of taste. I’m not joking. I never expected myself to become a type designer, but I am surprised how much I enjoyed it. That’s why I continue working on my project started at TypeParis15 (666 glyphs in Regular, doubled in Black, a few instances generated and the set of italics redrawn for the fourth time, from scratch, by now…). I don’t know now, where is the end — and when will I see it. Time will tell, let it be. In recent months I finished a wayfinding design for one of the Polish museums, and I found the course useful for this particular project. I also started a rebranding for a huge Polish company, and I found the ”crazy-tracing-paper-technique” learnt in Paris very helpful: you can draw, develop, and improve your design solutions very fast and immediately compare them — this analogue method is perfectly matching modern days, when you don’t have much time to think. It’s not old-fashioned! And the last thing: I still can hear advice from the instructors reverberating in my mind. I miss the gallant and distinguished suggestions of Mathieu Réguer a lot (yes, this guy always suggests and never criticises). I can hear the sentences from the unforgettable morning lectures of Jean François Porchez (what ”is allowed” and what ”is not allowed” in typography) almost every night… The extra guidance from Jeremy Tankard, Henrik Kubel, Luc(as) de Groot and Fred Smeijers was so fast that it precisely pointed out the main issues in our design. It is not possible to mention everyone in this short report. What I strongly advise: don’t think too much, just send the portfolio like me — and let one of the most important adventures in your life begin. NS: Since I’m still in my job right now, I’m channeling all the information I learned into branding and logotype creation. My perspective has changed on different levels and I definitely have a better eye for spotting the right ways to draw letters and to work with typefaces. Working with lettering feels like a totally different thing now as well, digitally and manually speaking. I’m sketching the first letters of an Arabic typeface right now and I’m hoping I’ll be able to invest more time into it this year.